Today I’m doing some watercoloring, and I’m using this inexpensive watercolor set to color in my images and create my background. The stamp set I’m using is Wplus9, Going Places. Super cute stamp set. 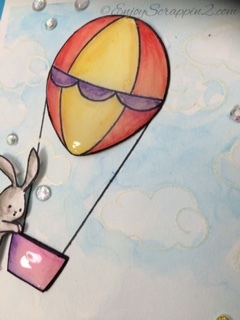 you can either tuck in the critter in the hot air ballon or you can have them hanging, like I did on this card. I wanted to share that you don’t necessarily need to spend a lot of money, in order to watercolor. You can start out with a set like this and see if you like it. 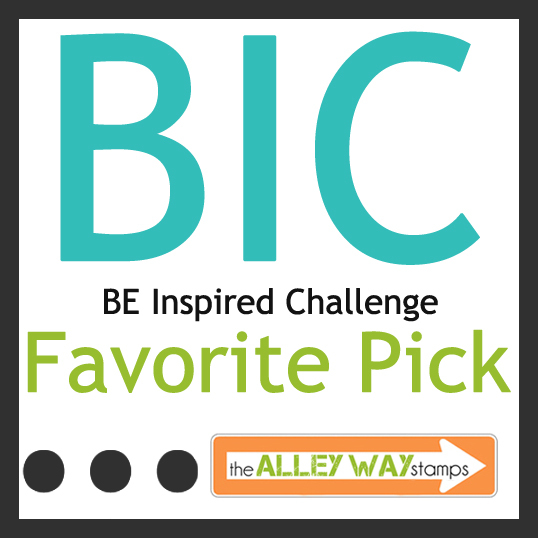 Then you can decide if you want to spend a little more. I created a background doing some embossing, which will resist the watercolors. I’ve embossed some clouds with white embossing powder and added just 2 shades of Blues, just dabbing the watercolor to the paper. I didn’t want to make the colors even, since were creating the sky portion. 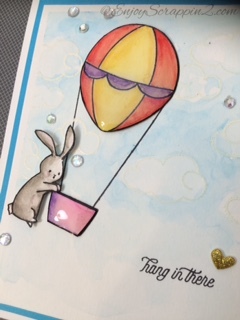 I stamped the hot air balloon and the rabbit on a separate sheet of watercolor card stock and watercolored them as well. 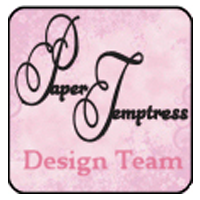 I fussy cut them out so that I can pop them up on to our background. I made a pretty ample card today. 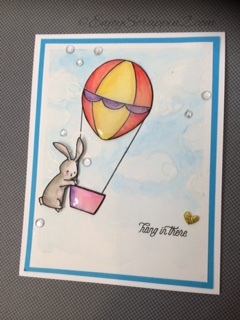 I hope you like this card and I thank you so much for stopping by. I still have the GIVEAWAY going on until tomorrow, Thursday at Midnight so go head over to my Youtube. 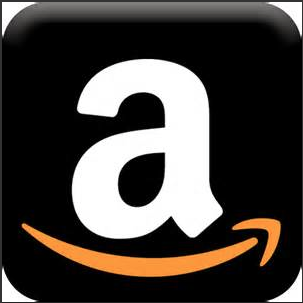 Subscribe and comment of your chance to win some prizes. I appreciate you guys so much, thanks again!